The Permanent Court of Arbitration is expected to announce its ruling next month on the South China Sea sovereignty-dispute case initiated by the Philippines against China. China has said it will not accept, participate and enforce the ruling. China has always stressed that the South China Sea sovereignty dispute should not be viewed only from the perspective of the law, but also from the historical perspective: For example, the "nine-dash line" which should not be ignored, the long-term historical interests China has within the "nine-dash line", and the history of China's humiliation by imperialism. Why wasn't China's interpretation of history and modern law recognised by international history and legal experts? Lianhe Zaobao interviews academics from China, Singapore and Britain to explore the issue. Dr Wu Shicun, the president of China's National Institute for South China Sea Studies, felt a sense of pride when it came to historical archives. He told Zaobao from Hainan: "Our institute has the archives and historical documents on the South China Sea, from the era of the Republic of China, including photos of China sending warships to reclaim the islands and reefs in the South China Sea after the surrender of Japan at the end of World War II. Many foreign reporters and academics were surprised after they saw these photos." Chinese Foreign Minister Wang Yi said in March this year that the Spratly Islands are Chinese territories and "the Chinese people have the duty to defend them". Dr Wu said: "For many generations, we have learnt from geography textbooks since primary school that the South China Sea islands belong to China, and the "nine-dash line" is deeply ingrained in us. 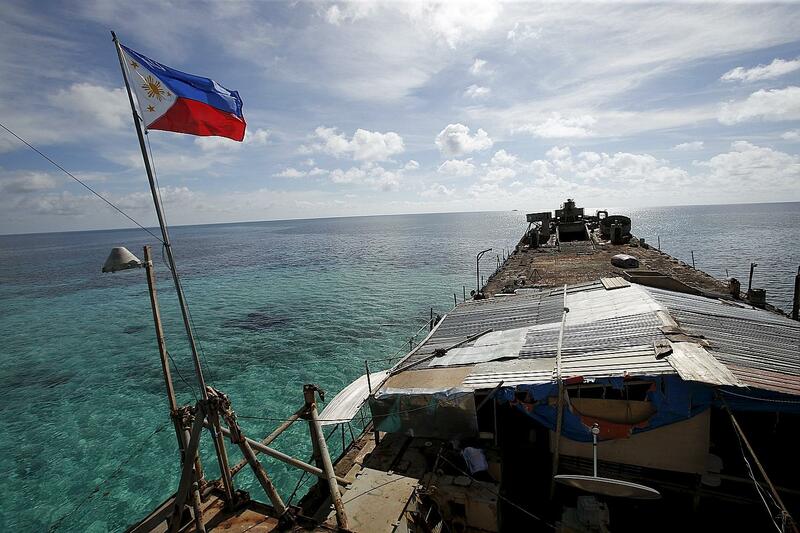 Which Chinese leader can say he will give up the nine-dash line or the low-tide elevations?" Dr Wu said that China has lots of historical data to prove that it has sailed to the South China Sea since the Western Han Dynasty, and that Chinese fishermen have been fishing in the South China Sea for generations. China said it has the historical rights to fish, explore the resources and jurisdiction over the freedom of navigation. However, this view has raised controversies among the international history academics and in the legal sector. Mr Bill Hayton, the Associate Fellow of Asia Programme at British think-tank Chatham House, said in his book The South China Sea: The Struggle For Power In Asia that there was no archaeological evidence showing any Chinese ships sailing to the South China Sea before the 10th century. He said that the earliest people to discover the islands and reefs of the South China Sea were the sea nomadic communities from the "Nusantao Maritime Trading and Communication Network" who had no attachment to anything like a state and not managed by any national organisations. Their trade network reached all the way from Madagascar to Easter Island, and from Australia to Japan. Several international scholars agreed with Mr Hayton's arguments. Why did the historical views of the international scholars differ so greatly from those of China, even though they were referring to the same sea? Dr Wu said: "I know Hayton, as he has come to China before. His research was wrong. The foreign historians do not know, because most of our historical data is in Chinese. I am working on digitising the historical data and the next step is to translate it into English." The international legal sector has also cast doubts on China's historical rights within the "nine-dash line". When the United Nations Convention on the Law of the Sea (Unclos) was adopted in 1982, the maritime historical rights of the states generally had to give way to Unclos' definitions of territorial sea and exclusive economic zones. In the case initiated by the Philippines against China, one of its requests included asking the Permanent Court of Arbitration to rule whether China's "nine-dash line" can be a valid basis for China's maritime territorial sovereignty, and whether China enjoyed historical rights within the "nine-dash line". Mr Hayton said in an interview with Zaobao: "The 'nine-dash line' is totally at odds with Unclos, but China is trying various ways to use other international laws to provide a legal basis for the 'nine-dash line'. Unclos is a set of relatively modern international laws where almost all the countries in the world, including China, took part in negotiating and formulating. Ironically, to avoid Unclos, China is turning to rely on traditional international law - an imperialist version of the law which it criticises frequently." In a commentary written for the Centre for Strategic and International Studies, PhD candidate Isaac B. Kardon said that China's legal experts seldom conduct independent research on the legality of China's stance on the South China Sea, and most of the time they tend to work backwards from existing or planned maritime policy decisions to find the legal basis for the authorities. Professor Wang Gungwu, the chairman of the East Asian Institute, National University of Singapore, analysed for Zaobao: "The Chinese believe that the law is man-made, and can be reinterpreted through consultations and negotiations. They also believe that the international law is linked to political interests. For the Chinese, they are not convinced that the international order is clear, objective and must be complied fully." Dr Wu defended China's position, and said that not participating, not accepting and not enforcing the court ruling did not mean China was "going against the law". He reiterated China's position - that the Philippines violated the agreement between both countries to resolve the dispute through consultations and negotiations after it proceeded with the case unilaterally without informing China. He said that it was legal not to take part in the arbitration, as China has made its exclusion declaration in accordance with Unclos and will not accept compulsory procedures for dispute settlement. Dr Li Mingjiang, an associate professor at Singapore's S. Rajaratnam School of International Studies, felt there may be three reasons why China was reluctant to participate in arbitration. Firstly, China has not yet adapted to resolving sovereignty disputes through arbitration; secondly, China suspected that the outcome would not be fair as the international court or arbitration mechanisms were dominated by the West. "The third reason is that China is worried about the next step if it loses the case. There is no turning back if it goes to court," Dr Li said. The arbitration court is expected to release its ruling next month. Dr Ian Storey, a senior fellow at the ISEAS-Yusof Ishak Institute, said: "China is a country claiming to follow international rules and practices, and its international reputation will suffer if it does not enforce the ruling." Dr Storey said that China may seek to "punish" the Philippines after the ruling is released, such as by restricting the number of Chinese tourists travelling to the Philippines, imposing non-tariff barriers on agricultural products imported from the Philippines, exerting pressure on Philippine troops stationed on the South China Sea islands and reefs, or expanding the man-made islands on Scarborough Shoal. Philippines president-elect Rodrigo Duterte did not seem to support resolving the dispute through arbitration, and said he hoped to hold direct dialogue with China. Dr Storey said: "If Duterte backtracks on arbitration and holds unilateral negotiations, it will alarm the United States, Japan and other claimant states like Vietnam." Dr Li said that the arbitration court may take into account the political factors in this case and come up with a compromise, for example, using vague language to express a ruling which is easier for China to accept. "The purpose is not to cause too much reaction from China, and maybe play a positive leading role in encouraging China to clarify the specific meaning of its sovereignty claims so that they will be more in step with the international law in future." China has enjoyed prosperity in history, but also encountered invasions by foreign powers and suffered years of humiliation in the last century. This has been considered as the historical complexion and historical baggage of the Chinese. But interviewed scholars pointed out that history has left a bigger problem for China - a sense of spiritual superiority which made it difficult to look at issues from the perspective of other countries. China found it especially difficult to convince other countries on issues of security. China may incur a barrage of international criticisms if it insists on not enforcing the legally binding decision of the arbitration court. To reduce pressure in advance and strengthen support from the people in the country, the official scholars from China published a 17,000-word commentary last week explaining the rationality of China's position on the South China Sea issue - and also pointed out specifically that China was once trampled by imperialism - as China seeks to gain the outside world's complete understanding on its maintaining sovereignty and territorial integrity. Ms Fu Ying, chairman of the Foreign Affairs Committee of China's National People's Congress and chairman of Academic Committee of China's Institute of International Strategy, Chinese Academy of Social Sciences, and Dr Wu published a joint article on the South China Sea issue last week in both China Newsweek and US magazine The National Interest. They wrote: "The Chinese people have not forgotten that the country stumbled into the 20th century with its capital under the occupation of the imperialists' armies, and for over a century before and after, China suffered the humiliation of foreign invasion and aggression." They explained that "that is why the Chinese people and government are very sensitive about anything that is related to territorial integrity and would never allow such recurrence...This is something the outside world needs to keep in mind when looking at China and trying to understand China's behaviour". However, from the viewpoint of neighbouring countries in South-east Asia, China was not the only country to be invaded by the imperialists, as South-east Asian nations which have sovereignty disputes with China in the South China Sea have similar experience of tasting the bitterness of imperialism. Historical humiliation did not mean a claimant state should be given extra respect and privilege on the issue of sovereignty claims. When China displayed the point of view that it has been bullied by the foreign powers in history, the reaction of some small neighbouring countries might be that it now appears that China is also a big country bullying a small country. Prof Wang said: "China's leaders know that is how several small countries view China, but they believe that, on the whole, this is the result of some people being misled by unfriendly media. China believes that these media are committed to maintaining the existing international order, but China does not agree that the existing international order is sacrosanct." In recent years, China's strong diplomatic actions and strong nationalistic rhetoric in the domestic media have some observers worrying whether China is expecting neighbouring countries to behave submissively and think about China's interests, like during the Ming and Qing dynasties. Prof Wang felt this was excessive worry. He said: "There is no evidence that the Chinese leaders are still living in the world of the Ming Dynasty. The Chinese scholars have also reiterated that the tributary system is over and it does not apply to the society today." However, he observed that China was still influenced by the thinking of a historical power when it interacted with the outside world. He said: "What is left over is a sense of superiority. Many Chinese inadvertently reveal the sense of superiority in their words subconsciously, and they are often not aware of the feelings of the other parties. "This sense of superiority is more prominent when China provides economic benefits to its neighbours, especially in some cases when the countries seek Chinese assistance voluntarily." Mr Hayton said that the Chinese officials seemed unaware of how other countries view their words and deeds, "which led to China's regional foreign policy making mistakes after mistakes". He said that a senior diplomat from South-east Asia told him privately that "China may not be a great nation yet, but it already has 'great- state autism'". "Great-state autism" is a concept raised by US military strategist Edward Luttwak in his book The Rise Of China vs The Logic Of Strategy. It means that the big countries do not know how to adjust their actions appropriately due to their insensitivity to the concerns of other countries. In Asean diplomatic circles in recent years, one can hear from time to time South-east Asian officials complaining of the "arrogance" of Chinese diplomats. Even former colonial power Britain grumbled quietly of having to "put up with" China. The British media reported last week that before Chinese President Xi Jinping's visit to Britain, Queen Elizabeth II felt that the attitude of a Chinese official making the security arrangements was "rude". Dr Wu was aware that neighbouring countries were wary of China. He said during the interview: "China is now in an awkward and special phase. During the initial period of economic reforms, China just thinks of how to comply and integrate into the world, and it can adjust itself according to the policies of other countries and even Japan. "Now that China has grown stronger, it is not possible for it to adjust its policies to adapt to neighbouring countries. But China's strength is not so large like the US' until small countries have to adjust their policies to adapt to it." Dr Wu said: "The small countries will still run where the US goes now." He felt that China's current transition from being a regional power to a global power is likely to continue for some time. He added: "China has to face the challenge of developing, while at the same time convincing the neighbouring countries that it does not pose a threat, and improving their sense of security." He pointed out that China advocates the Asian Infrastructure Investment Bank, the One Belt, One Road initiative and ideals like the community of common destiny to increase mutual trust with other countries. Dr Wu said: "China wants peaceful development and seeks common prosperity. "Time will prove whether China is a big bully, whether China feels might is right when it grows stronger." • The writer is the Beijing correspondent for Lianhe Zaobao. • This commentary first appeared in the Chinese-language daily on Sunday . Translated by Lim Ruey Yan.